It’s been a fantastic couple of days at Bedford Girls’ School. As an Apple Distinguished School we were proud to host over 100 educators from Finland, Poland, Denmark and Greenland. The delegates had come over to the UK to visit BETT 2017, and also visit other schools who use Apple technology to improve teaching and learning. As part of the visit we gave some short presentations on our iPad story, as well as how we use iTunes U and iBooks to support learning. I was nervous but excited to explain my part of the strategy as Digital Design Creator. The highlight of each of the visits was the opportunity to take a group on a learning walk, which is a tour of classrooms. The timetable for lessons remained unchanged and the visitors were joining ordinary lessons across a range of year groups and subjects. Jo MacKenzie, our Head, also wrote about the visits. 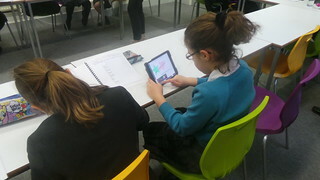 The girls were really excited to share what they got up to, and how iPads changed their education. Not only did we all learn a lot about how other schools approach technology and learning, but we swapped ideas and discovered how anything from the school day structure to how marking and feedback is handled differs.